The Platinum Rule is ready to take the place of the Golden Rule. Don’t do unto others as you would have them do unto you, do unto others as they’re like done unto them. The rule is key for Dr Tony Alessandra in his quest to help companies turn prospects into promoters. 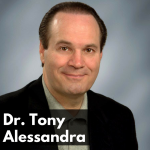 Tony was inducted into the NSA Speakers Hall of Fame in 1985, was selected as one of Speaker.com’s Top 5 Sales/Marketing/Customer Service Speakers from 2010-2014. Tony and Jason Hartman break down how companies can use the Platinum Rule to better their business, and turn your clients into happy marketers who will help you out-market, out-sell, and out-service the competition.